For the preparation of any dish required cutting tools – knives. With their help, cut up raw meat and fish before the heat treatment, peeling vegetables, fruits and cut into finished products. To choose a good knife, you must know the main characteristics of high-quality cutting tool. Determine the quality lisvernane in a knife is its cutting surface. To work in the kitchen is not irritated, choose sharp and durable tool. Blades for knives made of laminated forged steel, stainless steel and ceramics. High-quality metal uniform color and line sharpening of the blade without chipping. Look at knives with laser sharpened – they don't get blunt with use. Check out the way this treatment: if the cutting surface visible matte risks – feel free to buy this knife. Ceramics sharp and also does not require sharpening, but they are fragile and break if dropped. If you do not mind the high price, get a knife with a blade of forged steel. These products perfect sharpness, strength and durable service. Choose a material rackedla kitchen knife important convenient easy handle, which is made of various materials: wood, metal and plastic. Metal handle is durable and hygienic, but such a knife, quickly get tired hand – it's heavy. Wooden handle durable and lightweight, but loses its shape during operation and begins to slip in the hand. With the exception of the gift instrument models, where manufacturers use expensive types of wood. Choose to work in the kitchen knife with plastic handle: it is easy to hold, easy care, and it is more durable than wood. Pay attention to build quality Detail knife: blade and handle have to carefully adhere to each other. If they are joined using rivets, the blade should fill all the space of the handle. Inspect rivets themselves: some of them should not be cracking and chipping. Make sure before buying hold the knife in his hand. If the vending model has a packaging that cannot be opened without damaging – before you fake. Choose different knives , it is Impossible to purchase one all-purpose knife. For the convenience of working with products of different shape and size, there are plenty of knives: meat, vegetable, cheese, bread and other products. First pick up of kitchen 4 basic knife: large, medium, small, and bread. 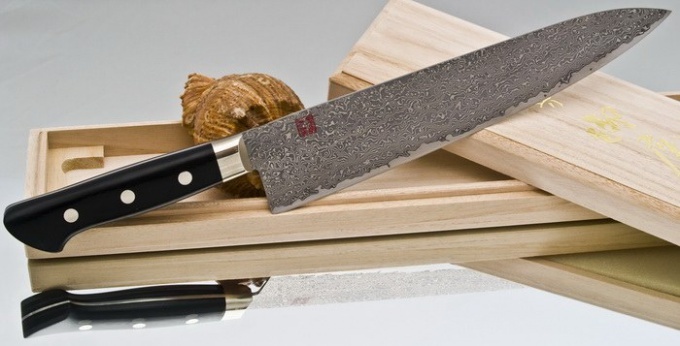 A large knife with a blade length of 30-45 cm is indispensable for cutting meat and fish. The knife is of medium length (30 cm) is also able to chop products, and small (20 cm) is useful when cutting fruit. Choose quality bread knife – it will not break the crispy dense crust and a beautifully cut soft middle. Please note that this knife is suitable for cutting watermelon and melon. Do not buy knives on the market stalls – this sale is characteristic of a low-grade product. Buy sharpened blades to handle cutting edge to the desired angle alone is not possible.